An object in motion tends to stay in motion with the same velocity unless acted upon by an unbalanced force. Unbalance can easily come in the way of a gentle sideways push during a sprint, such as that from Haussler yesterday which planted half a dozen riders including the Boy Racer himself straight down into the Wettingan straightaway like a bunch of toy pieces. The sideways fall of a cyclist on his bike at rest can be simply modeled as an inverted pendulum, with the center of gravity inscribing a circle from θ=0 to θ=π/2 before hitting the ground. If g is the acceleration due to gravity for earth and r the height of the center of gravity, the acceleration of the fall in the tangential direction is then a function of the angle of fall - gsinθ - and the force is mgsinθ. Integrating acceleration for velocity, you'll find impact velocity at θ=π/2 as v = √(2g/r). r = 0.8m is not a bad assumption for the center of gravity of a small sprinter like Boy Racer. Plug and chug and you find v = 4.95 m/sec ~ 10 mph! 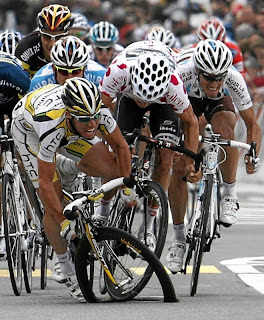 But in the case of the sprint, Cavendish is not stationary but has an inherent velocity in the direction of the finish line of approx. 45 mph (assumed). The impact velocity can be considered a resolution of these two orthogonal velocities and what you get is a round about impact velocity of 46 mph or so. This velocity is reduced to zero by the unyielding bitumen, but due to impact at an angle, its effect is slightly different from a more dangerous free falling vertical collision as the deceleration is spread out over more "seconds". Looking at the video above, it seems like Cavendish lost most of his velocity in a little less than half a second after hitting flat on the ground on his back. I obtained 200 milliseconds using a stopwatch. Assuming constant deceleration, that would be about 100 m/s2. Which is 100/9.81 ~ 10 g's of impact force spread over the surface area of his back. Is that a lot of force? Depends whom you talk to and which industry they belong to. But for the Boy Racer, it would really seem he were getting slapped hard on his back by a Sumo wrestler applying 10 times the former's body weight in force, roughly about 6 Kilo newton or 1300 pounds. Only for a fraction of a second, but certainly enough to have shocked him and given some nasty bruises to take home. Well distributed G-forces can be handled by the body in several times more in magnitude than what the sprint crash has seen (see below). But the human head is slightly more complex and this sensitive system does not tolerate very high peak forces, especially in the rotational sense. I have put a perspective on the peak G forces on a head with helmet before. You should also read about Head Injury Criterion. Ride safe. Survivable abrupt positive +g impact. Source. Strength of vertebrae and inter-vertebral discs in impact. Source.